Green Submarine: My Memories review and GIVE AWAY!!! My Memories review and GIVE AWAY!!! I was recently contacted by My Memories. They are a scrap booking company that has perfected computer scapbooking. They have a product called My Memories Suite III and asked if I would use and review it. but that is exactly what this software did, it hooked me. When I first downloaded the software on my computer it was a lot to take on. yes only two, tutorial videos and just like that I knew everything I needed. Right after the tutorials I dove right in and messed around a bit. The user interface is soooooooooooo easy and making a page is a sinch. This was the first page I made. Once you buy and download the software you will find an OOODLE of supplies already built in. You got your background papers, your stamps, your stickers, your die cuts. Pretty much anything you would see in a craft store in the scrap book isle, yep its there. I don't know how they did it, but they figured a way to make scrap booking that much easier. So get this, usually you would go to the store. You might have a certain page you are working on and need to stock up on supplies. You get paper, stickers, other embellishments. You also need to buy scrap booking tape and ribbon.... oh and don't forget the markers. All of these things are on a use once basis. You use a sticker on a page and its gone. So just in supplies alone you are already out maybe twenty bucks. Use a certain embellishment as many times as you want, it will never run out. But say you like the shopping part of scrap booking, the hunt for the perfect touch to your page. Never fear, My Memories has got you covered. 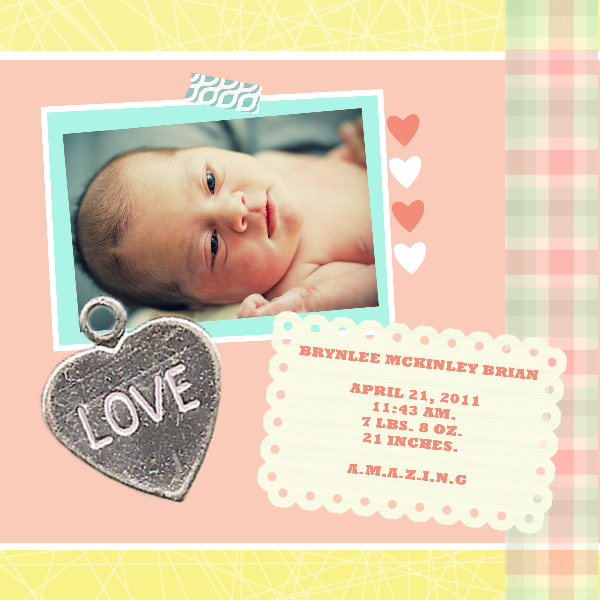 On their site they provide you with scrapbook shopping wonderment! They have a free page where you can download as many items as you want completely free. They have a 1.00 store, which I love, there are soooo many fun layouts and templates for sooo cheap. When you enter in the software you are asked if you would like to start from scratch and create something completely original, or if you would like to use one of their designer templates. When you download from the website you have a choice to put it directly into the software, or you can download it into your computer. I personally just download it directly into my computer. This is great because it makes any background paper, embellishment, banner, ect... into an easy to you jpeg or png file. That way not only can a make my scrap book awesome, but I can also use these fun prints and things to make my blog awesome. THIS SOFTWARE IS GREAT FOR BLOGGERS! Especially those of you that use your blog as a scrap book! YAY. This giveaway is open to anyone 18 and older worldwide. You are welcome to enter up to four times. All entries must be done in separate posts. ENTRY 1 : Just leave a comment telling me what would be the theme or your first page? simple enough.... I always think giveaways should have one freebie! ENTRY 2: Go to My Memories Suite blog and check out their "New Kits". Come back here and tell me your favorite kit. ENTRY 3 : Like My Memories Suite on Facebook ------- here. ENTRY 4 : Like My Memories Suite on Twitter ------- here. This giveaway will close on May 5th, 2012 at 11:59 MST. The winner will be selected by Random.org and posted on this page on May 7th, 2012. That person has 48 hours to contact me to redeem their prize. Otherwise, a new winner will be selected. If you would like to purchase the software, I have a special coupon code you can use. Go to My Memories Suite's website and add the software to your cart. Then just enter STMMMS84235 as your coupon/promo code when you checkout. This code will give you $10.00 off of the My Memories Suite 3 software. That's right! You can get the software for just $29.97 with the discount code and you can start creating! My friend has this software and really enjoys it. I would make a page all about my newest grandchild. The ice cream parlor pack looks fun. Oooooooo I love this.....I live in the middle of nowhere.....seriously......and getting to an arts store is a lot of work! I would do my first pages on my new baby Elliot......can't wait!! HI NICOLE HERE. I WOULD MAKE A PROJECT ABOUT OUR NEW PUPPIES. HI NICOLE HERE. PERSONALLY I LIKE THE FACEBOOK TIMELINES. NICOLE HERE. NOW FOLLOWING ON FACEBOOK. I would like to do some pages for my recent travels. I am always looking it creative ways to capture my adventures. It's a toss up between dot dot Christmas and the incredible kit. Love!! so cute! LOVE THIS! Ok i would definitely be making a page for Jeremy and I's Anniversary which is this Thursday!! The Project 2012 Date Strip Kit is sooo cute and i WAAAANT it! !